Sue Addington is a woman who I feel I would never have met had I not befriended her daughter and my, then, neighbor, Kim. Living so far from my own mother, I knew immediately that if I couldn’t have my mom, Sue would be the next best thing. Unfortunately, Sue doesn’t live close either. I so wish I could spend more time gleaning wisdom from Sue. Sue lives in Northwest Arkansas with her husband, Thom. She and Thom are the founders of the non-profit, giving ministry, Givingtons. To read more about their ministry you can check out their website here. Enjoy today’s guest post from Sue. “Hand, hand!” Those are words, clear and passionate, often squealed by our busy two-year-old grandson, Mateo. Immediately my hand is grabbed tightly as I’m pulled toward something very important in his tiny universe. I love those words. Why? Mateo doesn’t know it yet, but HANDS have important history for me. As a green college student, leaving behind a home freshly broken by my parents’ divorce, I was looking for answers. I soon found myself working in one of the Bethel College offices with a warm-hearted registrar, Paul. Before I knew it, his big gentle hands were patting my arm, having pulled my life story from me. He called his lovely wife, Faith, who joined him in extending an open-ended invitation to stay in their home. As both their welcoming hands opened the front door to me on that initial visit forty years ago, I was impacted in a way that has left a never-to-be-erased mark on my life. Their generous offer and warm hands of hospitality have inspired me to do the same. That sweet memory makes me want to keep my door open to the hurting, the wandering, and even the wondering – open for simple conversation over coffee, for a filling meal enjoyed around a full table of interesting people, or maybe just a warm bed in a quiet room for a night or two. 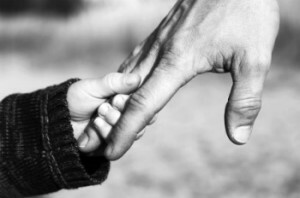 Just over thirty years ago, precious hands again touched me tenderly and memorably. In my arms our baby cried uncontrollably as I sat at the long fellowship hall table in the country church my husband and I served. From behind me two strong hands silently reached over my shoulders to take Baby Kim with her sobbing, the tears and all. A happy baby pulled from my arms would’ve made perfect sense, but dear Nesta, a loving, giving older woman, didn’t care about what made sense in those moments. She just took my precious bundle and walked out of earshot. The memory of those rescuing hands has never left me. Because of those generous hands, I have been inspired to do the same. I want to help even when it doesn’t make sense, to help others even when I long for peace and ease myself, to help when I see someone else more tired than me. Have you noticed, by the way – there always seem to be someone more tired and needy, longing for rescue? Seven years ago, my dad lay dying of cancer. While I watched him battle for his life in a great deal of intense pain, I was exhausted both physically and emotionally. There had been much travel for me between his home in Minnesota, our home in Arkansas, and our part time home overseas. Many days I awoke not remembering where I was. The weekend before he died, I was in yet another location, the cozy Alabama home of that grown baby girl, Kim, and her husband, Brax. They saw how drained I was, how quick the tears were coming, and so what did they do? They physically held my hand, hugging me tightly as I cried. (Ask our family, no one gives bear hugs like Brax!) It was exactly what I needed. I don’t ever want to forget how I was helped in my exhaustion and sadness and need, that it took time to hold my hand, to hug – to be generous in touching another. Question: Do you agree? Amazing, generous things await our touch – yours and mine both. What hands have inspired you?